Ancaster councillor Lloyd Ferguson will continue to gather information on a new standard for arsenic in drinking water that could force the closure of Ancaster’s artesian well. Hamilton Conservation Authority staff and the city’s health department are recommending the well’s closure because the water’s typical arsenic levels of 17 to 23 parts per million exceed the new provincial limit of 10. But at least two residents are disputing the claim that levels of arsenic — a natural ingredient — in the well’s water can cause cancer. “We’re going to take all the information from the community, have (conservation authority staff) correlate it, go see the medical officer of health, and say, ‘Is this accurate?’” said Ferguson. I would love to have a big picture of red herring in the middle of this (my presentation).The well, on Sulphur Springs Road, provided the former town of Ancaster with drinking water from about 1965 to the mid-1970s, when the area was converted to the current treated municipal water supply. The conservation authority purchased the site in 1998. Erin Davis, who holds a bachelor of science degree from McMaster University, told the Hamilton Conservation Authority board of directors that there appears to be a “double standard” at play in the province’s new guidelines on arsenic levels. “Science can be manipulated; data can be manipulated,” she said, noting the maximum allowable limit on arsenic in bottled water is 50 parts per billion, and bottled mineral water and bottled fruit juice is 100 parts per billion. “I would love to have a big picture of red herring in the middle of this (my presentation),” she said. Davis, a well-user for 10 years, also questioned whether any level of government could enforce a standard. According to the World Health Organization, she said, no authority has the right to legally enforce a guideline, and access to drinking water is more important than quality. Chris Krucker, who operates an organic farm in Copetown, said his family has been drinking the water from the well every day for 20 years. They go through up to 10 or more big jugs each week, depending on the time of year. Krucker said that on very short notice, close to 100 people concerned about the well’s fate attended a meeting last month organized by the new group Save Our Spring. “It was really clear from the meeting that people are concerned about the well and the closure of the well,”he said. Krucker said the well’s water is rich with beneficial minerals and, unlike city water, isn’t chlorinated and doesn’t have fluoride added. During his frequent visits to the well, Krucker said he has met neighbours, as well as people from Hamilton and beyond. 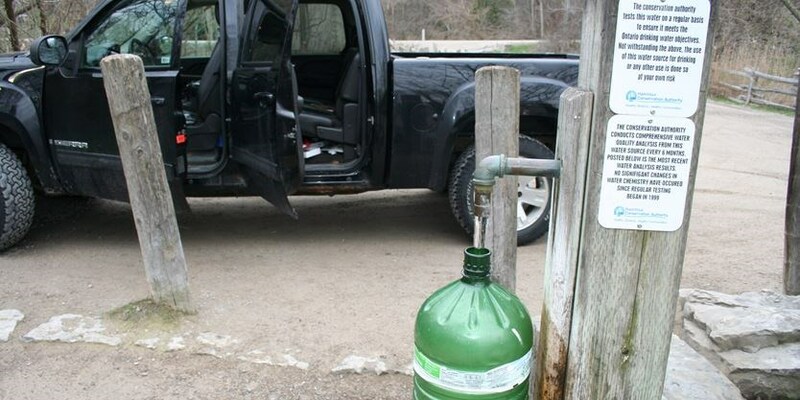 He said many people use the well as their sole source of drinking water, and asked the conservation authority board of directors to join with the community in finding a solution. “We want the HCA to work with SOS and other parties to develop a working group to see if there is another way to resolve this,” he said. But Krucker and Davis found a less than a sympathetic ear from some directors who cited as concerns liability issues and the wilful contravention of provincial legislation. “In order to assist, you are asking this board to advocate the province to change the rules that bind us because this board can’t violate provincial law,” said Hamilton city councillor and board member Aidan Johnson. The city’s public health department has ordered the well be closed by Jan. 1, 2018. The conservation authority board has put a decision on the well’s fate on hold until November. Ferguson said residents with a strong opinion on closing or keeping the well open should request delegation status at a future board meeting. To do so, contact Judy Love at 905-525-2181, ext. 112.